Things I liked: Has a strap and handles, zippers are crisp, plenty of pockets for accessories, and is flexible; I can fit my Crosman M4-177 (scoped) and 1377 (with a shoulder stock). Things I would have changed: Not much, a solid case that was perfect for my need to store the awkwardly shaped 1377 with a stock. What others should know: It will not fit traditional rifles but is good to store 2 smaller guns (carbines, adj. stock rifles, bullpup, etc.). Things I liked: Well made. Good zipper. Well balanced. Two large pockets on the outside, one zippered, one velcro. Things I would have changed: Velcro hold-down straps inside would help. What others should know: This case will not take a bullpup fitted with a scope. It is a perfect length for a long bullpup, but not high enough to accommodate a mounted scope. Shame. Perfect for a bullpup otherwise. One more inch higher would have done it. Things I liked: Sturdy, lockable and the extra pockets are nice. Things I would have changed: This case is really not big enough to hold two rifles safely. Velcro strapping would be a nice addition. What others should know: Like I previously mentioned I would not put two rifles in this case as you would most likely scratch them. Things I liked: Perfect case for may Prod and My Kalibrgun Cricket .35/9mm, great price plenty of room. 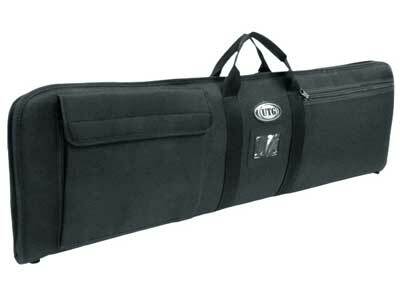 This is a very well built Gun Case by UTG, you wont find a better deal for such a great case that is lightweight durable. This is a very protective gun case with plenty of padding. Things I liked: A fine gun case for bullpups and other guns that are not very long. Things I would have changed: Nothing... great value as is.